« Ending HIV Presents 10’s 10’s 10’s Across the Board! 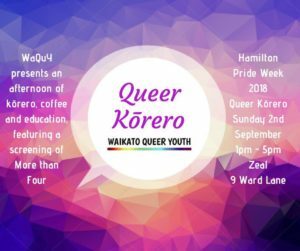 As part of Hamilton Pride Week 2018 | 10 Years on | Finding our History, Waikato Queer Youth (WaQuY) is hosting and afternoon of kōrero, coffee and education! We encourage parents to come along and learn more about the identities and issues that effect our youth and their whanau, all in a safe space where no question is a bad question. The afternoon will also feature a screening of More than Four – Exploring the identities and experiences of the beyong ‘LGBT’ identities as provided by InsideOUT. The event is open to the whole community and we can’t wait to announce who our guest speakers are, along with updates on event details along the way!